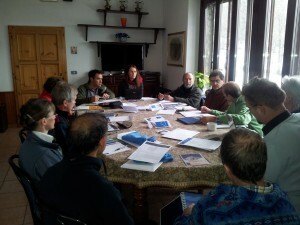 During the April 6-7 weekend the MWI Executive Committee met in Piani dei Resinelli, near Lecco, capital of the eponymous province, with representatives from seven countries. The city has obtained the distinction of “City of the Alpes” for 2014 thanks to its outstanding actions on waste management and soft urban mobility. After an introduction by the President of MWI, Jordi Quera, the theme of international actions was discussed which led to the decision that from now on all actions of this type should be proposed for approval to the Executive Committee which is declared as the only entity authorized to validate such status. After the sensitive topics of MWI finance and governance, an important part dedicated to MWI communication followed. An urgent need to improve the content of the website was strongly expressed, several actions have been taken to achieve this, including: the (re) creation of a communications group, the update of existing content, the outsourcing of the management and articles publication, the translation in English of national articles of international interest, a greater rigor in the publication of submitted articles. The publishing of a newsletter was considered, but no commitment was made. In the meantime the publication of a new leaflet is planned for the summer. The “Biella thesis”, the founding manifesto of Mountain Wilderness, will be supplemented by a text written by a dedicated team. Austria, this great alpine nation, is in the process of joining Mountain Wilderness, the team will likely have a steep start and any help will be welcome. MWI has decided not to join the IUCN for reasons of lack of money and inability to be actively engaged, but will participate in the “Mountain Partnership”. The news from Wadi Rum in Jordan are not good, the land is deteriorating rapidly, but little action is really possible on the short term due to of the stranglehold of the Bedouins. An MWI delegation went to Pakistan in 2012 to organize a training session of local mountain guides for next summer (2013). The budget for this project is almost completed with a major sponsorship from the Aga Khan Foundation, and various Italian contributions. => An inventory of the mountains and their environmental quality. Thirty entries have been recorded to date. This is not enough. Various means were proposed to have this number increased such as a simplified access to the database and increased promotion with and by the countries. => Or how to travel unassisted in a real wilderness (non impacted by human). The project was put on hold for reasons of unavailability and means of the project leader. MW Italy is totally against the idea of registering Alpinism -Alpine Style- to the UNESCO Intangible Heritage. MW Italy also considers that the work done in the Pointe Helbronner cableway upper station encroaches on French territory, a letter requesting clarification on the border line was sent to the Italian justice. => Or how to turn a barn into a rustic training center. The project continues with only the support of MW Switzerland, a group of MW Italy and the blessing of MWI.